At least two cities in Hidalgo County received a letter from U.S. Customs and Border Protection this week requesting access to land, another signal of movement in the construction of President Donald Trump’s border wall. The cities of Mission and Donna received a letter requesting “permission” to enter a portion of city-owned property for “border security tactical infrastructure, such as border walls, lighting, and roads. “We hope that you and other landowners in the Rio Grande Valley will assist us in our strategic efforts to secure our nation’s borders,” the letter read. The Donna City Council approved CBP’s request during a special meeting Monday, and the Mission City Council has not taken up the item. Included in the letter was a Right of Entry for Survey and Site Assessment document, a legal formality allowing the federal government access to land for environmental assessments, surveys and removing soil, among other permissions for a period of 18 months. While the Mission City Council was one of a handful of Valley local governments to pass a resolution this past fall opposing the construction of a border wall, the Donna City Council did not. Border fencing, though, already exists along most of the southern end of Donna. Mission City Manager Martin Garza said CBP’s access request deals, not with city property but rather land owned by the Catholic Diocese of Brownsville, which owns several pieces of property in the area. Spokeswoman Brenda Nettles Riojas confirmed that the diocese received access requests for neighboring Juan Diego Academy and La Lomita, a historic chapel and the city’s namesake, located along Levee Road just feet from the Rio Grande. “Our attorney is currently reviewing the request so we can determine how best to proceed,” Riojas said. It remains unclear what type of infrastructure could be placed on the requested land in Donna and Mission. 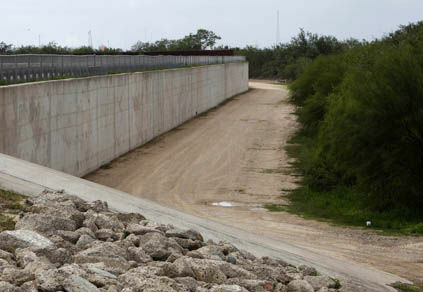 Last month, CBP Acting Deputy Commissioner Ronald Vitello said the agency plans to install 35 new gates along 55 miles of existing border wall to close “critical gaps” in the RGV sector, in addition to building 25 miles of new levee wall in Hidalgo County. Congress approved $1.57 billion for new border infrastructure construction for fiscal year 2018, which began in October. The same day Donna city councilmen approved CBP’s access request, Starr County officials met with U.S. Border Patrol and CBP representatives to discuss “Right of Entry for Survey and Site Assessments” that will be sent to local landowners in the next three weeks requesting access to their private property. The number of landowners in Hidalgo and Starr counties that will be impacted by the path of border wall construction remains undisclosed. The cities of Pharr, Progreso Lakes, Los Indios and San Benito — all of which own property near the Rio Grande including portions of international bridges — have not received the letter sent to Donna and Mission.